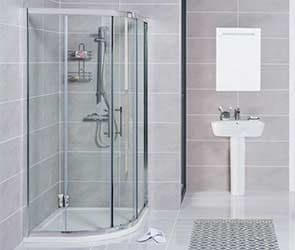 Shower Enclosures | Shower Cubicles & Units 5% discount? 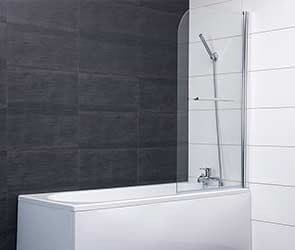 Shower enclosures are a superb space-saving solution for bathrooms of all shapes. In addition, they help to keep the rest of your bathroom dry whilst creating privacy and comfort when showering. 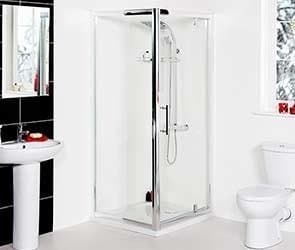 We offer you a wide range of options when it comes to shower enclosures. From bi-fold to pivot doors and quadrant to corner entry, our shower enclosure doors easily adapt to your bathroom space. The materials we use are strong and long lasting and all shower enclosures come with a 10 year 'Fit and Forget' guarantee. 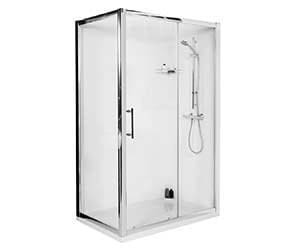 ###H2###Shower Cubicles###/H2### One of the most important aspects of your bathroom, a shower enclosure is a superb space-saving and practical solution that helps to keep the rest of your bathroom dry when showering. Additionally, the right shower enclosure can really make a stunning impact in your bathroom suite and provide a form of privacy and comfort when showering. ###BR######BR### As a bathroom feature that is most likely going to be used on a daily basis, it is important that you choose a shower cubicle that is not only fit for purpose, but also fits perfectly with the rest of your space. At Bathroom Takeaway, we understand that no two bathrooms are the same, which is why we offer a range of practical solutions to meet your bathroom and shower requirements. From quadrant shower enclosures, to bifold, walk in, corner entry and pivot shower cubicles, we have everything you need at Bathroom Takeaway to create the ideal showering space.###BR######BR### ###H3###Choosing the right shower enclosure###/H3### At Bathroom Takeaway, we offer a wide range of shower enclosures, all of them large enough to offer a comfortable showering experience but built to suit any style and size of bathroom. Before buying your shower enclosure, it is important to check you have the correct measurements to ensure the ideal fit for your bathroom.###BR######BR### Our smallest shower enclosures comprise of a 760 x 760 cubicle, perfect for a smaller space. Still comfortable to shower in, this size shower enclosure is available with either a sliding door, pivot or bi-fold shower door. ###BR######BR### The largest shower enclosure sold at Bathroom Takeaway is 1200 x 900. Ideal for a family bathroom, where size may not be a consideration, we also offer wet room designs at this size, depending on your bathroom requirements. 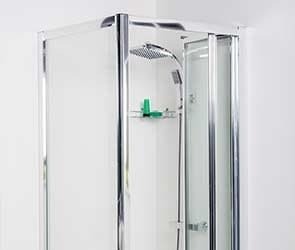 ###BR######BR### The main difference between the types of shower enclosures is the movement of the doors. It is important to consider which type of door will be most suited to your bathroom suite. 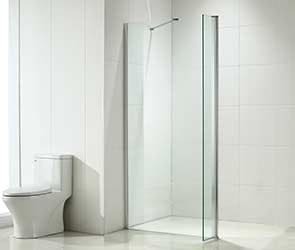 Sliding door shower enclosures are ideal if space is limited, or if you are looking to install your shower in the corner of your bathroom, as they don’t open outwards. 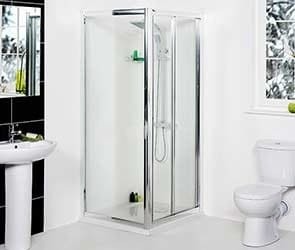 Another option if you would like your shower to fit seamlessly in the corner of your room is the corner entry cubicles, which simultaneously offer a stylish finish to your bathroom suite.###BR######BR### Our quadrant enclosures feature an aluminium frame that is really set to brighten up your bathroom space. Curvaceous and polished, the quadrant enclosure brings an understated elegance to your bathroom, whilst offering the illusion of a bigger space. 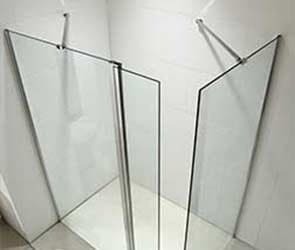 ###BR######BR### ###H3###Wet Rooms###/H3### Another popular shower enclosure available at Bathroom Takeaway is the walk-in shower, also known as a wet room. Ideal if you want to give your bathroom a contemporary, minimalistic design, these showers fit perfectly with a rainfall shower head to maximise your showering experience. ###BR######BR### Extremely modern, almost any bathroom can be transformed into the immersive shower experience that a wet room offers, through just a simple installation. Perfect for smaller bathrooms or in a home that doesn’t require a bath, the wet room is easy to maintain and can really give your bathroom that spa like feel. ###BR######BR### Whilst installing a wet room can be a sizeable job, at Bathroom Takeaway, we offer products from glass screens to trays and accessories, helping make the job that bit easier. It is important to note that we recommend seeking the services of a qualified plumber to ensure your bathroom is fit for the transformation. 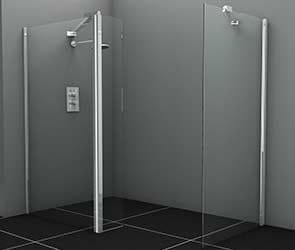 ###BR######BR### ###H3###Easy Clean Glass###/H3### The shower cubicles here at Bathroom Takeaway come with an easy clean finish, to make sure your doors stay streak-free and shiny, with minimal effort. Complete with water-repelling technology, the easy clean finish helps prevent limescale, stains oil and dirt from sitting on the glass, offering an impressive shine, 24/7. It’s as easy as 1-2-3.